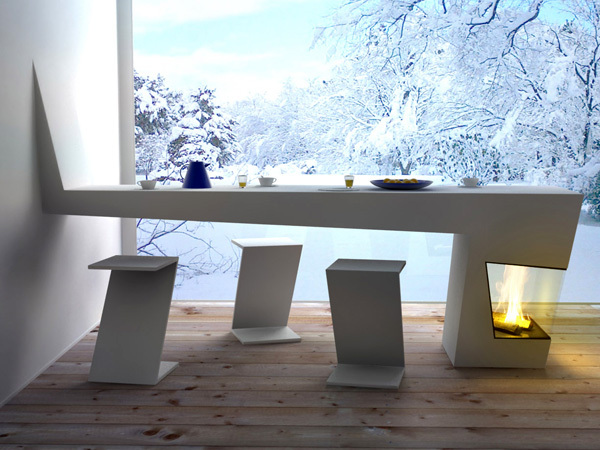 Warmpath is an incredible kitchen table with a built-in stove. It is a great combination for homes in cold climates. When table meets a stove an unusual object Warmpath emerges. 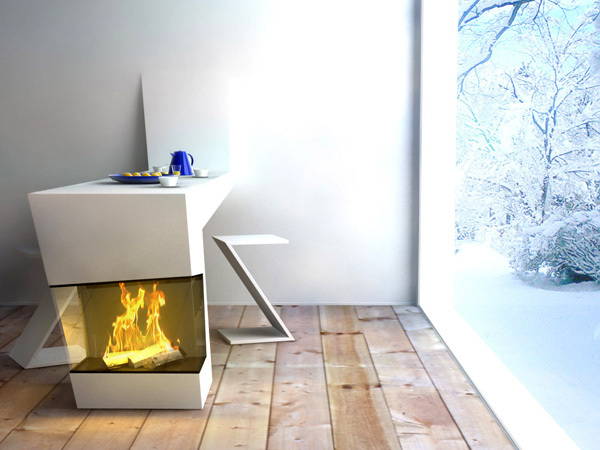 A designer from Luxembourg Michaël Harboun has designed this incredible kitchen table combined with a stove called Warmpath since the stove gives a table a nice warm temperature. Objects, like chemical elements, all have their respective and unique properties. The table and the stove both have the property of gathering people. Like a chemist who experiments by combining elements, I have been mixing the nature of these two objects to create a new reaction. The conducts of the stove run through the surface of the table. The Corian material is able to resist to high temperatures and cools down the heat to a comfortable and warm feeling. But it’s not just two objects merged together. Warmpath is extremely stylish in all senses displaying asymmetric graphic angles and lines. It is contemporary and beautiful and those Z-shaped chairs are simply charming. Fire instantly makes a place look and feel warmer and lighter. It also gives a kitchen a cozy feel while adding sharp modern touch to the decor as well. It is also a great idea as it not always possible to install a fireplace in one’s kitchen or any other room for that matter. The fire in Warmpath is protected by yellow-tinted glass that gives a table a nice contrast between pure white and blazing yellow. I just imagined how great it would be to sit at the warm kitchen table during cold winter mornings eating breakfast. Magical. What do you think about kitchen Warmpath by Michaël Harboun?